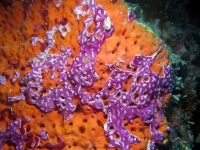 This Didemnum ascidian (Purple sea mat) is a colony-forming ascidian with a vivid purple color. The areas of the siphoned are lighter to white because of the higher concentration of spicules. Colonies consists of many different individuals working together to be more efficient at filter feeding. Unassessed by the IUCN Red list, but not uncommon in the Central and West-Pacific. They can be found in the Indo-Pacific, from Indonesia and the Philippines to Micronesia and Western Australia. 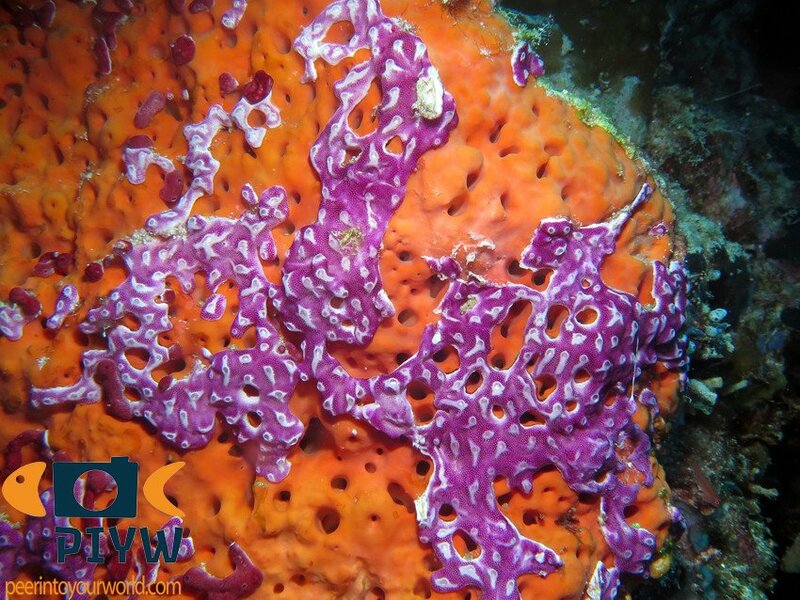 They prefer hard substrates in coral-rich areas, reef flats and slopes. The depth range is unknown. Members of the family Didemnidae are hermaphroditic, being able to both self- en cross-fertilize. Eggs develop into lecithotrophic larva before settling to the bottom and transforming into their adult form. The entire colony of Didemnum sp. can grow over 15 cm. in width. They are filter feeders. By pumping water into their oral siphon and out the atrial siphon a water stream is created. The stomach filters out food particles. There are many color morphs known from the family Didemnidae, but it is to day unclear whether they are separate species or actually belong to the same.